Gerald and Kris Wiz are joined by Josh Hallmark (Playlist, Our Americana) to discuss and compare our top 5 rap/hip-hop albums from the 1990s. I got the three whitest dudes I could find to break it all down for you. Thug life. Enjoy and share! Find our guest, Josh, on Twitter @PLAYLISTpcast or @OurAmericana. 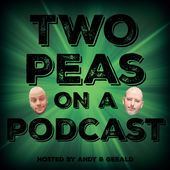 Also follow his 2 Pods a Day campaign @2PodsADay. “Around the Way” by LL Cool J. 1990 Def Jam Recordings. All Rights Reserved. “Rebirth of Slick (Cool Like Dat)” by Digable Planets. 1993 Elektra Records. All Rights Reserved. “The World is Yours” by Nas. 1994 Columbia Records. “Rebirth of Slick (Cool Like Dat)” by Digable Planets. 1993 Elektra Records. “Rosa Parks” by Outkast. 1998 LaFace/RCA Records. “97 Bonnie & Clyde” by Eminem. 1999 Aftermath. “Me Against the World” by 2Pac. 1995 Interscope/Atlantic Records. “Sabotage” by Beastie Boys. 1994 Grand Royal Records. “Juicy” by Notorious BIG. 1994 Bad Boy Records. “Creep” by TLC. 1994 LaFace/Artista Records. “My Name Is” by Eminem. 1999 Aftermath. “Butter” by A Tribe Called Quest. 1991 Jive/RCA Records. “I’ll Be Missing You” by Puff Daddy & The Family. 1997 Bad Boy Records. “Who Am I (What’s My Name)?” by Snoop Doggy Dogg. 1993 Death Row Records. “Nuthin’ But a G Thang” by Dr. Dre feat. Snoop Dogg. 1992 Death Row Records. “Doo Wop (That Thing)” by Lauryn Hill. 1998 Ruffhouse/Columbia Records. “Let Me Ride” by Dr. Dre feat. Snoop Dogg. 1993 Death Row Records.